← The Hunting Ground – An interview with Cliff McNish and a chance to win one of five copies for your own sleepless nights. As the publishing world goes through changes with the explosion of ebook releases, here’s an example of where a No.1 Amazon hit as an ebook (staying at that prime position for over a month) has been snatched up and will now see it released in its printed form this month. 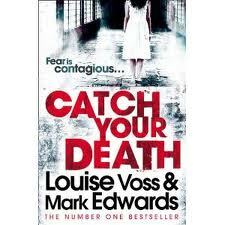 The writing partnership of Louise Voss (@louisevoss1) and Mark Edwards (@mredwards) had seen similar success with their first ebook, Killing Cupid, which will also be receiving the printed treatment in July 2012, and a follow up to Catch Your Death, The Antidote, will also be released in January of 2013. It’s clearly a recipe for success and, if Catch Your Death is a good example of what they can offer, then Nicci French and the Kellerman’s have another great writing duo to contend with on the crime fiction shelves from now on. Clocking in at just under 400 pages, Catch Your Death deals with the terrifying secrets that might lie within the work of a facility for research into viruses and, in particular, into the common cold. It sets off with that premise and troubles any reader who may have a post-Christmas sniffle in the same way that viewers of Psycho didn’t want to take a shower for weeks. The story itself starts off twenty years in the past, with Kate Maddox (now a Harvard Professor, but then a student) taking part in a volunteer program at the unit where scientists are seeking a cure for the common cold. A horrific fire in the building put an end to her stay there and also robbed her of her love, Stephen, a doctor at the unit, leading to Kate leaving the UK to set up a new life in the US. Now, Kate is back and with her young son, fleeing her husband, Vernon and trying once again to make a new life for herself and for her boy. 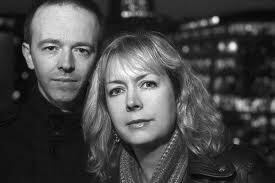 It’s then, twenty years later, that she chances to meet Paul, Stephen’s twin brother – of whom she had no knowledge of before and through their meeting, and falling for each other, they begin to question what happened on the night of the fire at the unit and just what research was being carried out there. This is compounded and made ever more urgent by a great creation in the form of psychotic killer, Sampson, who works for the unit and is seeking out the same prey as Vernon – they are both hunting Kate. Read simply as a premise, the chance encounter with an unknown twin did initially seem a little convenient a plot mechanism, but it and the pacing of the narrative are handled so well that it flows very well into the story and the pace is so fast that I couldn’t help but be swept along for the ride. Like all great medical thrillers the big ‘what if’ hangs over proceedings and that, along with the nagging wonder as to what actually might go on behind the doors of our medical research facilities, provides more than adequate scares, and that’s without the added terrors of a cruel husband and a stop-at-nothing killer thrown into the mix. So, whilst I’m sure that lingering sniffle you have right now is nothing more than that, you may want to wrap up warm when you go out to the bookstore or you might well Catch Your Death. My first recommended read of 2012 – Happy New Year, and keep well. You simply can’t beat an incongruous twin. Loving that device. Do you happen to know if HC editors/Sam Copeland at RCW insisted on rewrites of the ebook version before its transition into print? We did make changes, yes, but it was mutually agreed rather than insisted upon! The new version contains several new scenes and fills in more back story. We think it’s even better now. Killing Cupid is being republished with no changes, apart from fixing a few typos. Thanks for picking up on this and replying so quickly. Thanks for getting back to me personally, Mark. I really appreciate it. Glad to find out the changes were mutually agreed – you hear so many horror stories about authors losing all control over their work. I love the new cover too. How thrilled are you at the moment? Congratulations on your success – what a year 2012 promises to be!